Pre Jym is a pre-workout marketed by Jym Supplement Science. It's rated highly in reviews and won the "2016 Pre-Workout Supplement of the Year" award. This pre-workout is priced at $47.97 for 30 servings, and comes in three flavors - Cherry Limeade, Orange Mango, and Rasberry Lemonade. It sounds like a tasty product, but in this case, it's what's inside that counts - a supplement's ingredients determine whether it will be an effective product overall, or a disappointment. You've probably checked some ingredient lists of supplements in the past, not knowing 90% of the ingredients on it. Trying to understand what's good and bad in gym products can be intimidating, if you have no idea what to look for. 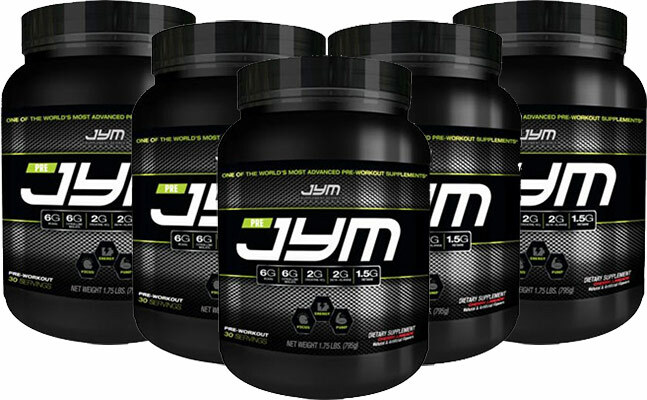 As experts and veterans of the supplements industry, we've explained everything there is to know about Pre Jym's ingredients. But don't worry - we've cut out the confusing terms and given everything to you in a simple, easy to understand format. You've probably heard about Creatine before - it's been used as a gym supplement since the 1990's, making it one of the most reliable ingredients on the market. Creatine Hydrochloride is a form of Creatine, which is proven to boost your strength and endurance - you'll feel the difference towards the end of sets and your overall workout. It's believed that Creatine Hydrochloride works better in lower doses than Creatine Monohydrate, but this isn't the case. Creatine Monohydrate is the most effective form of Creatine and there's been tons of research proving it's the best. 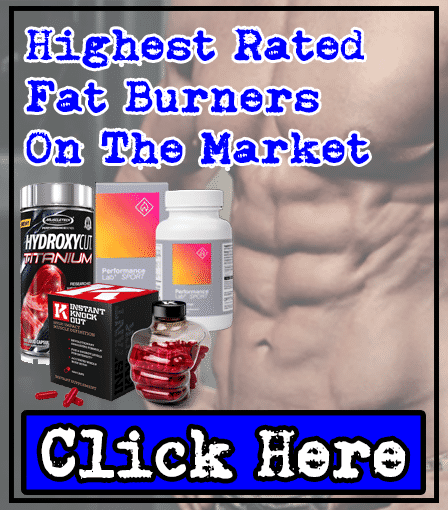 Don't get us wrong - Creatine Hydrochloride is still an effective ingredient, but Creatine Monohydrate is simply more reliable due to the countless studies conducted on it. Creatine Monohydrate is the most effective form of Creatine. But Hydrochloride is still beneficial. 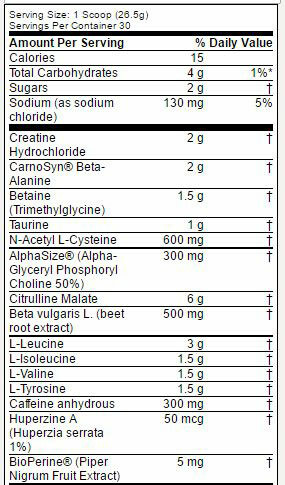 Jym Supplement Science has made a mistake by adding this ingredient, but they're not the only ones doing it. You're probably thinking, why? Well, many companies use Beta-Alanine as it's shown to improve muscular endurance. However, it can cause paresthesia when consumed in doses over 0.8g-1g (800mg-1,000mg). Paresthesia is a tingling on the skin of your face, chest, hands, and extremities - it's not life threatening, but it's uncomfortable enough to ruin your training session. Unfortunately, Pre Jym contains 2g, meaning you're very likely to experience paresthesia. We recommend staying away from Beta-Alanine to avoid this unwanted side effect. But if you don't trust what we're telling you, just try and keep your Beta-Alanine intake under 0.8g-1g (800mg-1,000g). Beta-Alanine proven to boost your endurance. But causes paresthesia (tingling on skin of face, chest, hands, extremities). There's other ingredients that offer same benefit but without any side effects. Also known as Trimethylglycine, it's a molecule that regulates water balance in cells and is believed to boost endurance. However, there's been no evidence of Betaine improving endurance, or any kind of sporting performance in studies. Basically, this ingredient is ineffective in a pre-workout supplement. But one negative is that Betaine can cause fishy odors in your breath and body secretions - it doesn't benefit your sporting performance, but it gives you an unpleasant side effect. Betaine doesn't offer any benefits to improve your training session in the gym. But causes fishy odor in breath and body secretions. This is an organic acid that contains sulfur. It's most commonly used to reduce cramping due to its ability to improve blood flow. However, its not proven to deliver any benefits that will enhance your workout in the gym. For this reason, its not vital to a pre-workout supplement. 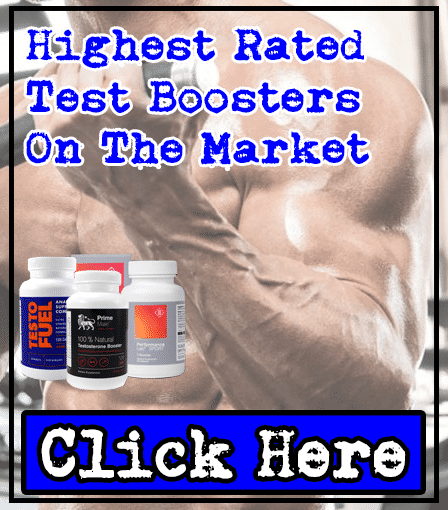 Jym Supplement Science should've replaced this ingredient with something like Rhodiola Rosea - Rhodiola Rosea improves your strength and mental function (memory, focus, and reaction time). Taurine can be useful in certain supplements that can cause cramping. But cramping shouldn't be an issue with pre-workout supplements. There are better ingredients suited to this product, eg. Rhodiola Rosea. Also known as NAC, it's used to produce L-cysteine in your body. It's believed that NAC improves endurance and strength. However, studies have proved that NAC doesn't deliver these benefits. Not effective in aiding your training session. This is a compound that's most commonly used for its ability to boost mental function (memory, focus, reaction time). Alpha-GPC has been used in Pre Jym as it's shown to improve strength in studies. However, the problem is with the dosing. In the same studies, Alpha-GPC only enhanced strength in doses of 600mg - Pre Jym only contains 300mg, meaning it's under-dosed to deliver this benefit. Mainly used to improve mental function. 300mg means Alpha-GPC means its under-dosed - 600mg needed to enhance strength. Citrulline Malate is a combination of L-Citrulline and Malic Acid - L-Citrulline boosts nitric oxide levels, while Malic Acid helps boost energy levels, making this ingredient a great addition to any pre-workout. It works by turning into L-Arginine in your kidneys, where it raises your nitric oxide levels and dilated your blood vessels (vasodilation). This leads to an increase in blood flow, resulting in you experiencing intense muscle pumps while lifting weights. However, if you're thinking, why not take L-Arginine directly? 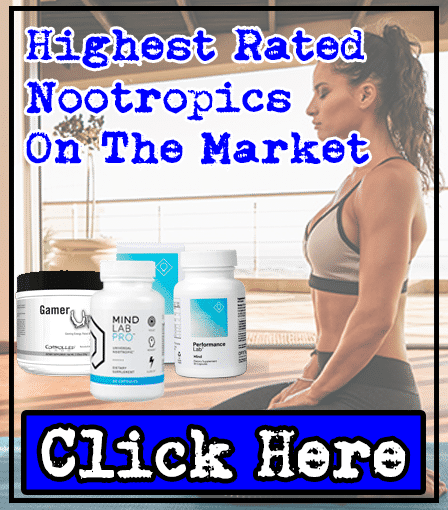 Here's why - L-Arginine has a poor absorption rate, meaning it fails to raise your nitric oxide levels when orally supplemented. On the other hand, Citrulline Malate has a great absorption rate and is reliable in delivering muscle pumps and a boost in energy. Jym Supplement Science has dosed Citrulline Malate perfectly at 6,000mg - its optimal dose is between 6,000mg-8,000mg, so you'll be sure to experience its full benefits. Citrulline Malate is a combination of L-Citrulline and Malic Acid. Turns into L-Arginine in your kidneys, where it boosts nitric oxide levels and dilates your blood vessels, resulting in intense muscle pumps. Optimal dose is between 6,000mg-8,000mg. Beetroot Extract contains high amounts of nitrate, which when ingested, raises your nitric oxide levels. This encourages vasodilation (widening of your blood vessels), which results in intense muscle pumps while you lift weights. Not only does this enhance your endurance in the gym, but it also promotes muscle growth. High amount of nitrates raises nitric oxide levels, resulting in muscle pumps during training session. Muscle pumps enhance endurance in the gym and muscle growth. BCAAs (Branched Chain Amino Acids) are found in any food containing protein, such as eggs and meat. For this reason, you don't need to supplement BCAAs. Studies have shown that BCAAs promotes endurance and fatigue, but you can consume enough of it through a well-planned diet. However, it's beneficial if you're a vegetarian or vegan. Supplementation isn't necessary - you can consume enough through a well-planned diet. But it's beneficial to vegetarians or vegans (as they obviously don't eat meat). Not needed in a pre-workout supplement. This is one of the most beneficial and safe nutrients out there. Caffeine is used in countless products worldwide on a daily basis, like tea and coffee. As well as being in some of your favorite hot drinks, it delivers benefits such as improved strength, endurance, and mental function (memory, focus, reaction time) in the gym - making it perfect in a pre-workout. Pre Jym contains the upper limit on Caffeine, with the recommended daily allowance (RDA) set at 400mg - Pre Jym contains 300mg, meaning you may have to avoid coffee and tea throughout the day if you're using this product. We recommend looking for a pre-workout containing 150-200mg of Caffeine per serving, to avoid unwanted side effects like jitters and energy crashes. One of the most beneficial and safe nutrients on the market. Enhances strength, endurance, and mental function (memory, focus, reaction time). RDA is set at 400mg. The ideal dose of caffeine is 150mg-200mg per serving. This is a compound extracted from the Huperzia Serrata plant family. It's most commonly used to enhance mental function (memory, focus, reaction time) - it's more suited to a Nootropic product. Jym Supplement Science has added Huperzine A into their pre-workout to boost your focus during your gym session, but it's not needed since Caffeine delivers the same benefit. Huperzine A also comes a risk of numerous side effects, such as nausea, diarrhea, sweating and loss of appetite. We recommend staying away from Huperzine A, to avoid suffering from these side effects. More suited to a Nootropic product - it's only benefit is enhancing mental function. Comes with risk of numerous side effects, such as nausea, diarrhea, sweating and loss of appetite. Everyone knows what Black Pepper is, as it's used in food around the world. However, it also improves the absorption rate of other ingredients that it's consumed with. This means that it can improve the overall effectiveness of a product. There's no negatives to having this in a supplement, but it doesn't enhance key things like strength or endurance. Improves absorption rate of other ingredients it's consumed with. No negatives or side effects to it. But doesn't improve key things in a pre-workout (strength, endurance, energy). 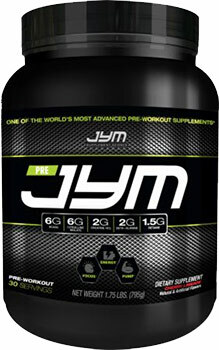 Pre Jym contains a few ingredients that can cause side effects, such as Beta-Alanine, Betaine, Alpha-GPC, and Huperzine A. We recommend staying away from these ingredients to avoid any unwanted side effects. 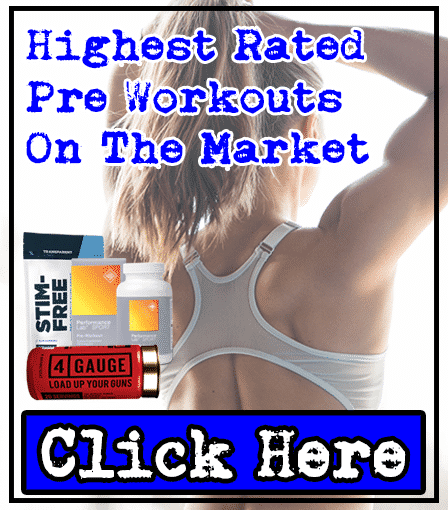 Pre Jym is a decent product and we can see why it's been given good reviews elsewhere - it contains optimal amounts of Citrulline Malate and Creatine Monohydrate, which is rare to find in pre-workout supplements. 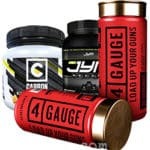 However, Jym Supplement Science should've left out some ingredients, such as Beta-Alanine, Betaine, Alpha-GPC, and Huperzine A - to keep you safe from unwanted side effects. 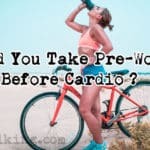 Ultimately, the list of potential side effects, and some of these ineffective ingredients for a pre-workout, have lowered Pre Jym's overall score. Bottom Line: You should look for a product containing more key pre-workout ingredients, such as L-Theanine - L-Theanine works in synergy with caffeine to form a 'smart-caffeine', giving you enhanced benefits of caffeine (improved strength, endurance and mental function), without the risk of side effects like jitters and energy crashes.